Systems company. To that end, the company is tions in the shipping industry. Edge modi? cation of the familiar Schilling Rud- maneuverability. At the beginning of the year, der has become ? 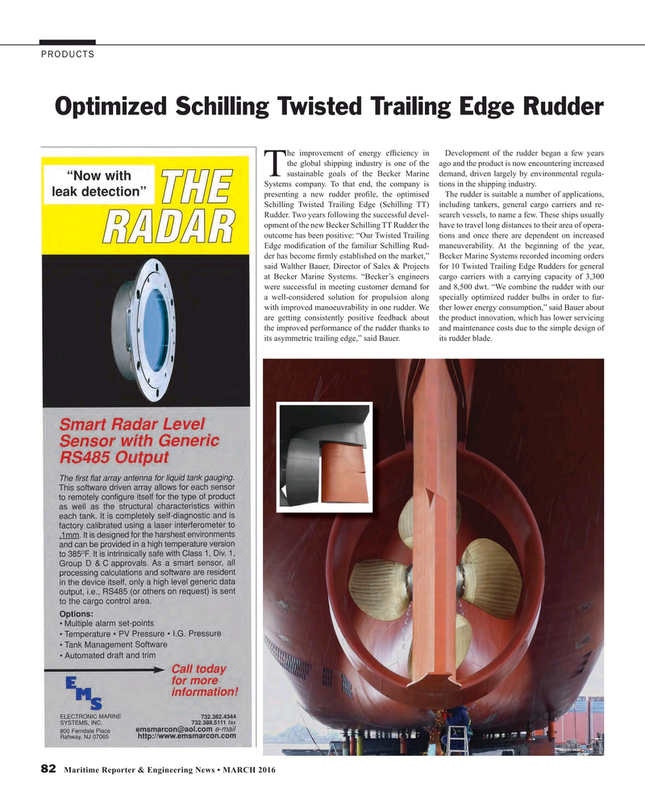 rmly established on the market,” Becker Marine Systems recorded incoming orders said Walther Bauer, Director of Sales & Projects for 10 Twisted Trailing Edge Rudders for general at Becker Marine Systems. “Becker’s engineers cargo carriers with a carrying capacity of 3,300 were successful in meeting customer demand for and 8,500 dwt. “We combine the rudder with our a well-considered solution for propulsion along specially optimized rudder bulbs in order to fur- with improved manoeuvrability in one rudder. We ther lower energy consumption,” said Bauer about are getting consistently positive feedback about the product innovation, which has lower servicing the improved performance of the rudder thanks to and maintenance costs due to the simple design of its asymmetric trailing edge,” said Bauer. its rudder blade.